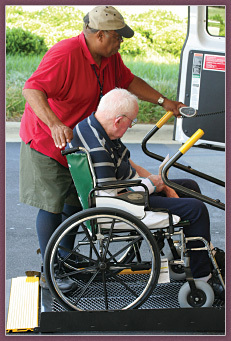 Transports seniors as well as people with intellectual and phisical disabilities. Takes people to Charlottetown and Summerside for medical appointmnets. Hours of operations: 8:00am-4:00pm, Monday to Friday. Transportation for the mobility challenged with competitive rates, flexible hours, professional drivers who are CPR and First Aid qualified, and lift-equipped vans. Located in Queens County, operating 365 days/year. 7:00 am - 11:00 pm. Provides accessible transportation for persons with mobility impairment, intellectual disabilities, and seniors. Our buses are wheelchair accessible. Operates Tyne Valley to North Cape, with planned excursions to other areas. Arranges and books accessible trips specifically for persons who use wheelchairs, slow walkers, seniors, and all people that with mobility impairment. Wheelchair Accessible Taxi (Van) in Summerside, PE.